5 out of 5	Beneficial to all officers. 5 out of 5	His life is most important to me. ? I purchased this little light for my husband who is a Police officer. This light is small and compact but is REALLY BRIGHT. 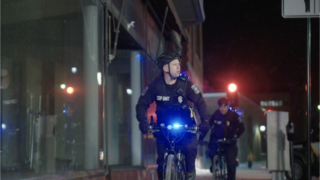 I wanted to make sure he is seen especially on traffic stops and accident scenes. 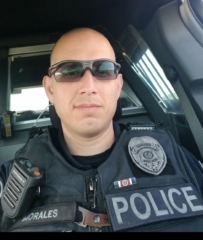 With all these LEO’S getting hit while conducting stops along roadways this is just a sense of security for me that he will be seen and come home safely to me after his Night Shifts. 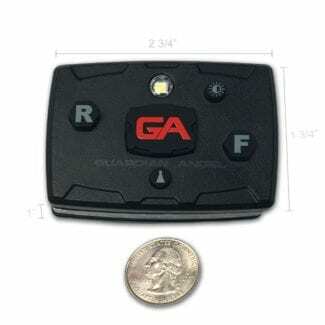 Small light and very simple to use and recharge – very good for being seen at road side at night and a useful worlight. 5 out of 5	Does exactly as promised. I am a Police Dog Handler in Australia looking for a secondary light source as you often run out of hands quick when managing a dog in a work environment. After much research I purchased this Guardian Angel Elite series light. Red light – great for low light conditions. I was able to use this light to monitor an offender in custody without ruining my night vision which allowed me to remain situationally aware of my surroundings. White light – great general purpose work light. Perfect for writing infringements, searching vehicles, prepping my dog……all hands free!!!!! Very happy. Emergeny red and blues – great for helping backup find me and my dog when we have located an offender in the field. Great for added safety on traffic stops. Tested with Police Helicopter who report high visibility. Highly recommended piece of equipment that will quickly become a mainstay of the law enforcement industry. 5 out of 5	It's all about your safety! I’m a rural deputy, with about 1000 sq. miles to patrol. We have a couple of small towns with their own police, and Interstate 40 runs right through the middle of the county. Our duties are quite varied. About a month ago, I was on a call checking on a pedestrian walking down the interstate, when a passing car came way too close. Even standing off on the shoulder, it was a bit nerve racking, and I decided to see what was available to make myself more visible. It didn’t seem practical to don a reflective vest for every scenario contacting someone on the side of the road, and I wanted to find something that was with me all the time. I found the Guardian Angel. It seemed a little pricey, but after relating my close call to my wife, she encouraged me to get one. It arrived quickly after my order, and with the additional code I had found while researching it, it also came with a nice clip. 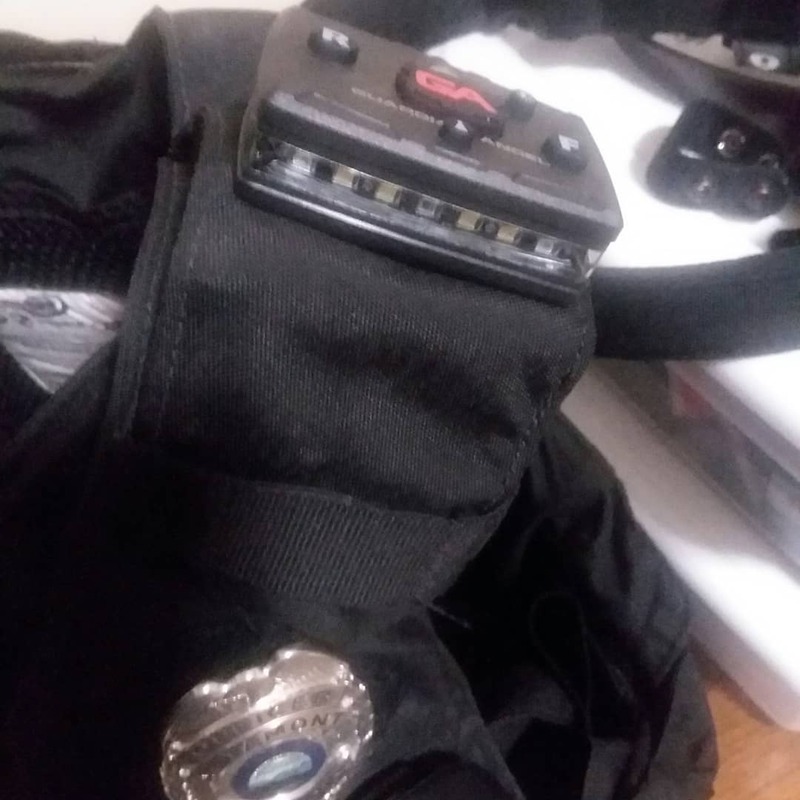 The magnet and backing plate that comes stock with it is REALLY strong, and I have no doubt that it would hold the device through most materials, but the optional mounting clip gave me a little more peace of mind when attaching it to the epaulet of my exterior vest carrier. I sometimes have to walk through brush, or scuffle with an uncooperative subject, and I just like the mounting clip. Now for what I use the light for most of the time. The red and white work lights! I bought this thing for the flashing warning light, for safety reasons, but I use the heck out of the solid white light! I use it a lot for writing things in the dark. Notes, reports, citations, etc. Sometimes I have to show civil papers to folks at night, and its really handy to have your own light source. Ever handcuff someone, then have trouble finding the holes to double lock them? The Guardian Angel makes seeing them so much easier!The same goes for detaining some one, then taking the cuffs off in the dark later. This little light rocks! I’ve used the light for ambient lighting to watch the eyes during HGN tests. Its not too bright if you point it down just a bit. Its also great for watching other aspects of Standardized Field Sobriety testing, keeping your hands free for whatever you need to do..write or catch the drunk before he falls…. The red light light that you can choose it awesome for writing citations without ruining your night vision. I keep finding ways to utilize this little light, and I love it! I highly recommend this gadget if you need more visibility and would like a simple light for hands free operation! 5 out of 5	AMAZING PRODUCTS! This is super bright, light weight, and easily adjustable. Great tool for work… Highly recommend. Compact device that puts out a lot of light. I show the light to others and they think it’s a great product. When I tell them the price they hesitate a little and then I ask them how much is their life worth. I perform traffic duties and with 3 brightness settings this light works great both daytime and nighttime. As a volunteer Fire Police Officer, I never know when I will have to respond, so I keep the light with me all the time. Shoulder magnet mount and I am always visible in traffic no matter what I am wearing. I love the light so much that I bought two. This way if someone else is directing traffic with me, I have one for them. 5 out of 5	Quality product all around! 5 out of 5	JUST BUY IT! IT IS PERFECT FOR MY SHIFTS IN THE TRAFIC POLICE. PEOPLE SEE THE LIGHTS AND KNOW THE POLICE IS THERE. ALL PEOPLE SEE IT FROM DISTANCE, SO THEY KEEP THE LAW ON ROADS. YOU CAN BUY DIFFERENT COLORS, AND ATTACH IT WITH THE STRONGEST MAGNET THIS DEVICE HAVE – ENYWERE! IT WILL ATTACH TO EVERYTHING. VERY RECOMANDED. I KNOW MY FAMILY IS SAFE! I was so excited when I got my device. It helps keep me hands free when I’m on a traffic stop or making a person contact at night. Another great use I found is to turn it one when directing traffic in low light conditions. They stand by their product too! My rain jacket snagged on my device while I was working a wreck and my device fell off and got run over by a car. I emailed the company and returned the broken device for a brand new replacement. They have come through in more ways than one. 5 out of 5	Excellent Device! I purchased this light a couple of years ago and it is on the previous platform. This little light packs a lot into it. I use the rear flash and the forward white and red lights solid lights the most when on traffic stops which alerts the traffic behind me and allows me to have the forward lights to use as ambient light in conjuntion with a flashlight during my interaction. The front red light is nice to use inside of the vehicle while my partner and I are driving and I’m typing up stuff and using the red light to review notes while an route to jail instead of using the overhead red light or using those forward solid white/red again to dig for stuff in the trunk. A couple of command have joked about it and asked if I make siren noise and activate it while in a good pursuit, but all in all it is all in good humor and they like it too. I have convinced others to get one and they agree it was worth the purchase. Quite of few of the fire dogs have stopped me too and inquired but I have not seen any of them yet wearing one. My battery is still going strong and I seemingly have to charge it very infrequently. 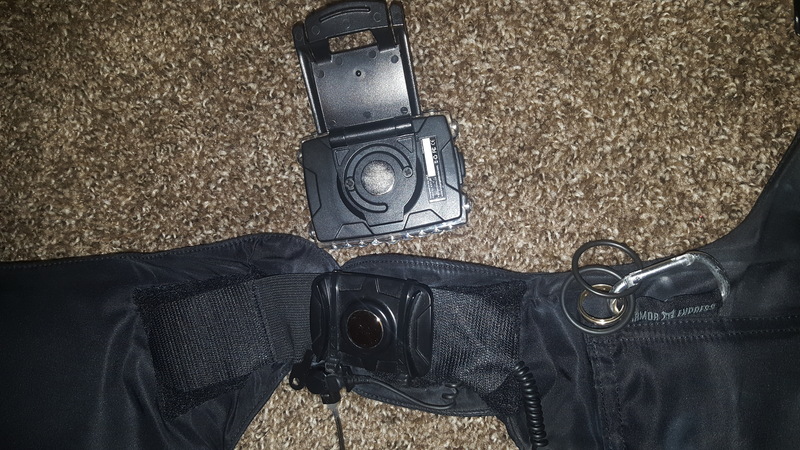 I bout the shirt clip with mine and actually took the magnetic clip and zip tied that to shoulder area of my body armor so that when I apply the clip to my left shoulder of my shirt the magnet helps stabilize the light to keep it from flopping a bit. I also glued a 1/16″ x 3/4″ magnet to the shirt clip just to give added power to give better holding power through the fabric and plastic. I love it and couldn’t imagine not having it on the street. The only change I wish there could be would be a flash pattern selector to offer a choice. I also wish that the back, instead of just red and blue that a couple of white LEDs would be integrated as well to flash. Nonetheless, it is a great product and I’d buy it again without thinking twice. This light is mounted above my left shoulder on my outer carrier. The light is very light weight and I don’t notice the light at all. 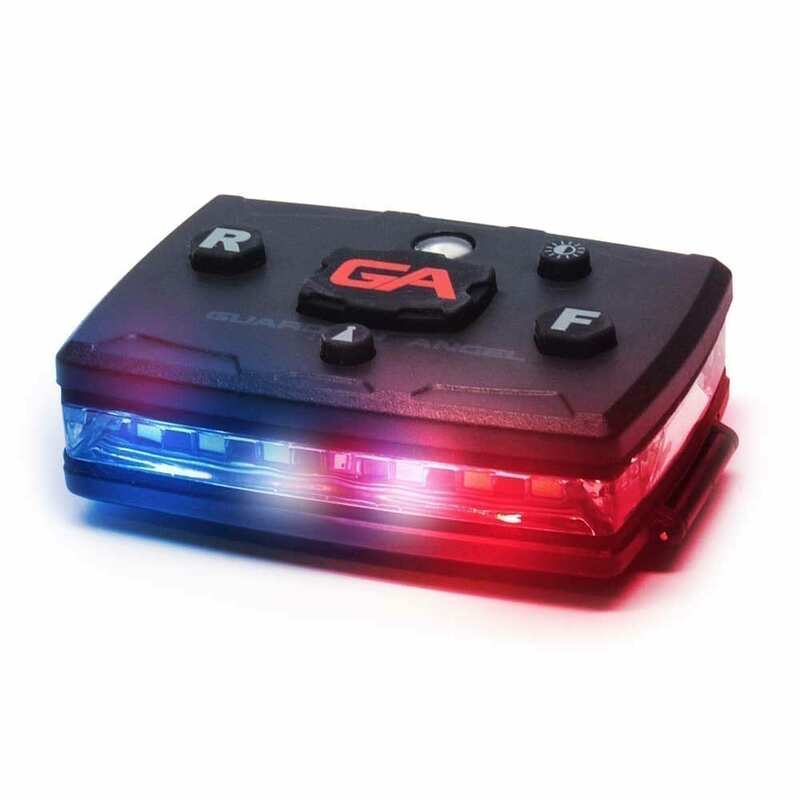 I activate the front white light and the rear flashing lights when conducting traffic stops. It definitely helps being seen by passing traffic. Helps keep hands free when making contact with the white light in the front. Definitely worth the money spent. Other officers are considering buying one. 5 out of 5	Awesome sauce. 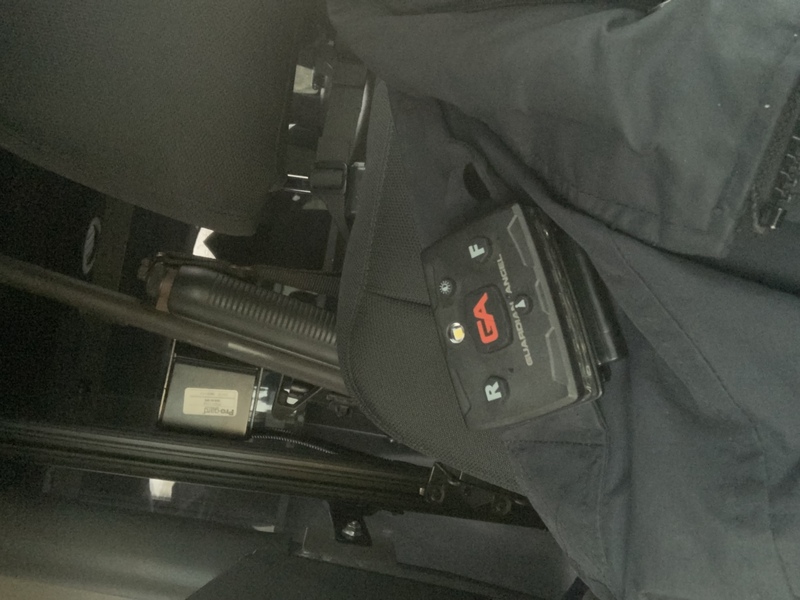 I’ve used the GA on several traffic stops, accidents and several other incidents including vehicle searches, and I love it. Several deputies, State Troopers and even fire fighters are impressed with the distance of visablity of the product. No more holding a flash light for me. 5 out of 5	Great product!! 5 out of 5	A necessity for every LEO. 5 out of 5	Not just a light!! 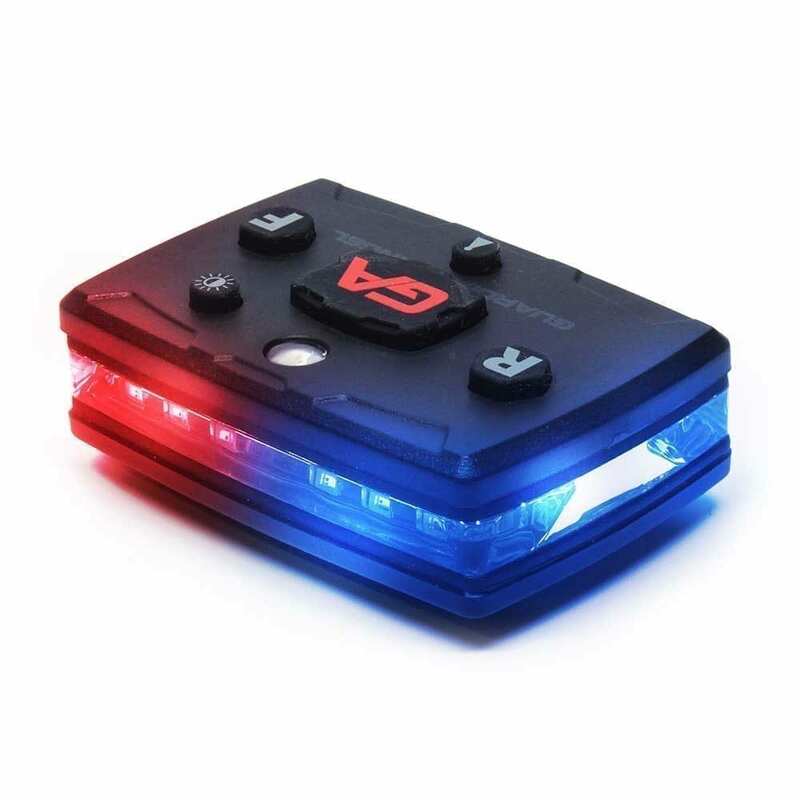 My son order elite series law enforcement light for fathers day. The first night I wore it on a highway crash, every firefighter and assisting officer on scene wanted info about it. It’s a must have at night a long with wearing your visible traffic vest. 5 out of 5	Awesome! Everyone’s jealous! I got the R/B device hoping to use it for big events during the summer. But, it really came into it’s own on night shift. I use the rear lights while directing traffic, the front red LED for reading DL’s, and the front flashlight mode for searching cars. I don’t know how I got along on mids for so many years without one. 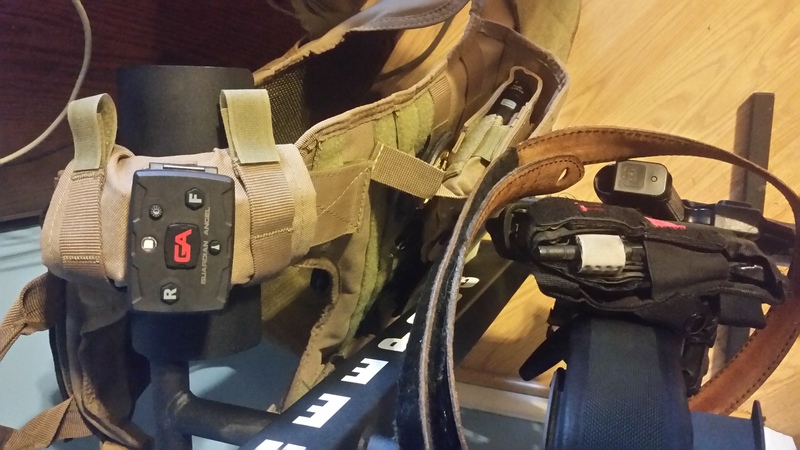 Get the strap and epaulets clip mount with it, you won’t regret it. 5 out of 5	Every Police Officer Needs This Device! I’m a motor unit in the chicago area and love this light. Works great for many different situations. Being hands free is great! Battery life is great and even at high speeds on the bike the magnet holds tight. 5 out of 5	Light it up! 5 out of 5	Amazing. Hands down one amazing product. Simple, easy to use. Product is so light that you forget it’s there. Well worth the money. Just for even the hands free flashlight, couldn’t be happier with this product. Although retired – I bought this for a state trooper friend as a Father’s Day gift – he loves it. Prior to giving it to him, I scrutinized the device thoroughly and it is amazing! Easy to manipulate without having to avert your attention from the task at hand. It really gives you the feeling of having a guardian angel on your shoulder looking out for you. Wish I would have bought two! 5 out of 5	All Officers need this! It is the best light I’ve ever purchased! You can be completely hands free and do what you need to do! The lights are bright allowing you to be seen whether you are directing traffic or on a traffic stop every Officer/First Responder needs this device! It is durable and it is just an awesome device! I was out assisting a trooper with a MVA and he saw it and loved it he is going to talk to his Captain about getting them for all of the troopers! 5 out of 5	Finally, someone got it right! The product is very bright. Once it arrived I charged the device and went right to work and it helps so much when on the side of the road to on coming traffic. I am already fixing to buy another one for my K-9 since this is an amazing tool to have!! I also had questions when purchasing the device and the amazing staff answered every question with quick responses! 5 out of 5	Great product. TL;DR…buy this product you won’t be disappointed! I came across the Guardian Angel from searching for new hands free light options available to Law Enforcement. The design, finish, and quality of the Guardian Angel is top notch. Solid and well built product. The lights are bright and illuminous. 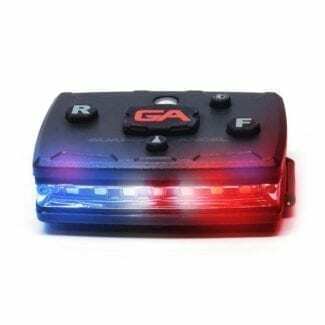 Since I purchased the Guardian Angel, I’ve used the emergency red and blues when directing traffic at an intersection without power late at night, and the takedown lights when speaking to subjects, allowing me to stay hands free. As a note, when receiving your Guardian Angel the buttons to activate the lights are stiff out of the box. I recommend pressing them numerous times to “break them in’ to assist when one is out on the street. I have found I needed to press the button a couple of times before the light out illuminate. I highly recommend you watch the videos already produced by the Guardian Angel staff. They say all the benefits of the Guardian Angel in real situations. 5 out of 5	A great tool! The guardian angel keeps me safe and visible on the highways. Let’s me see into vehicles without holding a flashlight. It has helped me numerous times be able to be seen at night especially when helping to locate someone who is lost in the woods. This has definitely been my guardian angel. So this little device is not a tool for all jobs, but it is most definitely a tool for many jobs! 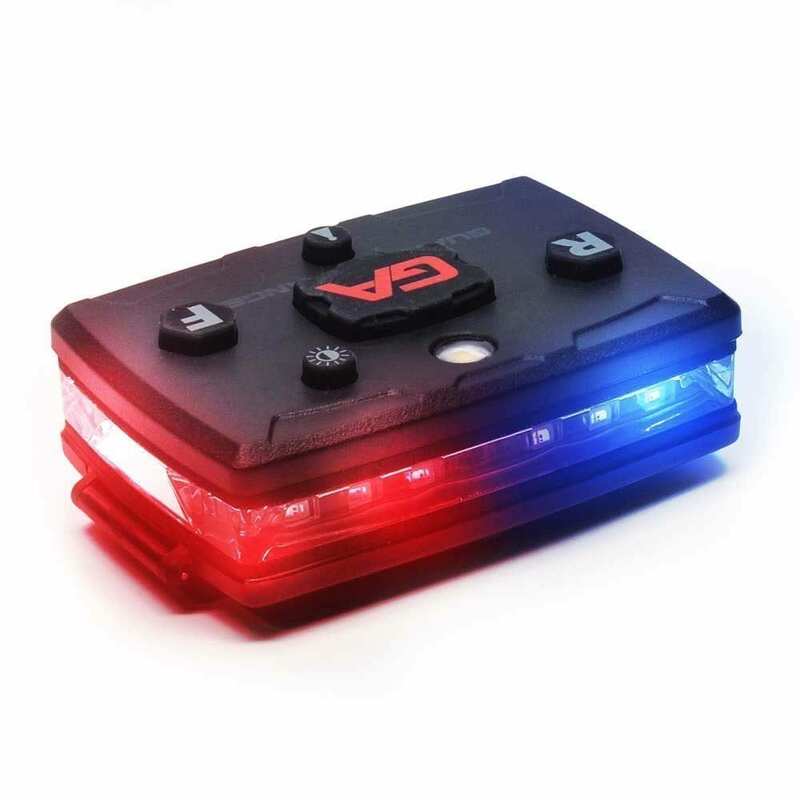 The tool I use the most on it is the red work light for when I need glare free light while inside my patrol car. The white take down light is great for taking notes and interviewing (non combative) subjects. It’s not quite bright enough to use as a primary light, but for what it is, it gives plenty of light for working with when the scene is safe. 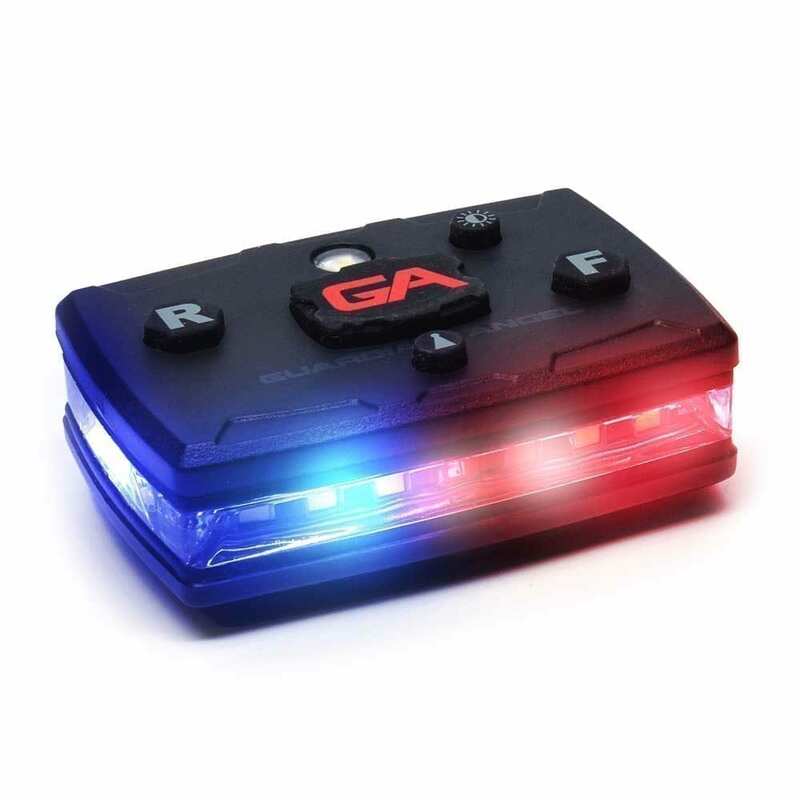 As for the red and blues, they are incredibly bright and I use the “rear deck lights” on traffic stops at night. If I’m working a collision or having to work in the road away from subjects, the 360 illumination is great to make me visible. But simply turning the front and rear decks on at once is also plenty of light for that. If you buy one, expect your coworkers to call you Robocop etc. But they’re all gunna want to play with it regardless. Great product with great battery life and durability. 5 out of 5	Absolutely Love This Quality! 5 out of 5	Awesome device. 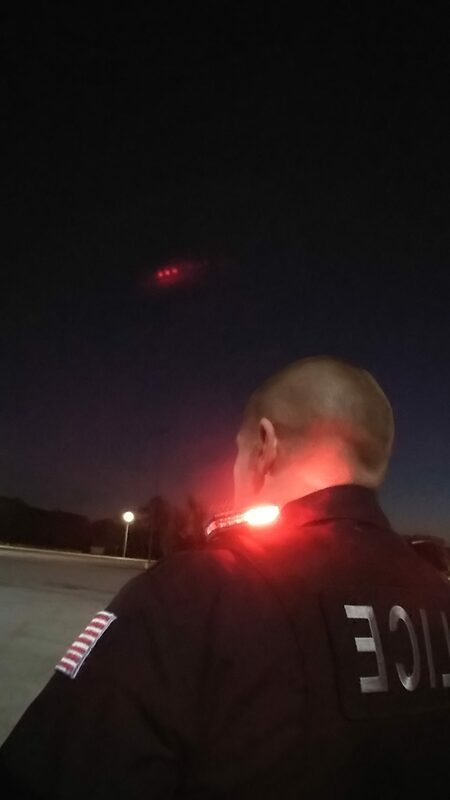 I’ve been a night shift officer for about 5 years now and just recently acquired the guardian angel Elite Series light. I frequently use the rear flashing lights while on a traffic stop to help Illuminate Me for other drivers. But probably the most useful has been the white “takedown” lights. It keeps my hands-free but still illuminates my contact. I didn’t think it would be that useful when I got it but it has certainly proved itself. I use the light on a nightly basis. I have a QuiqLite also which is good for writing but the Guardian Angel device is far superior for scene illumination and safety warning. The only thing that has me a little nervous is the magnetic retention through my carrier so I beefed it up with some adhesive Velcro. 5 out of 5	Small, lightweight and amazing! I have an older three LED light I used to carry but it wasn’t very bright and had nothing but problems with the replacement of the batteries. After watching the video on the Elite Series light, I thought I would give it a try. I was never so shocked at how phenomenal THIS light is! It started out with me being a bit skeptical with the weight, size and low profile but it’s ease of operation, ease of charging the lights internal battery (which it does extremely fast), the unbelievably powerful magnet is only surpassed by the brightness of the lights LEDs. While it has an option to switch between the three brightness and battery use, I have opted to keep it on the brightest setting. The ability to use the front light of Red/White LEDs for reading or searching is a great idea and help as is the ability to choose from activating the front bank of LEDs, rear bank or, if you need, hit the large ALL light’s button and be amazed at how bright the front, rear and top strobe LED lights can make you visible from a long ways away. 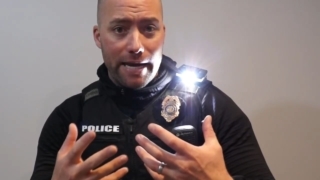 If I had any reservations or skepticism about the quality or effectiveness of this light, it’s easy to say that this light took away all doubts and is a great product for on or off duty. This is one impressive safety device and I couldn’t be happier. I highly recommend you get one for yourself and see exactly what I’m saying, you won’t be disappointed. I purchased this device, even though I am retiring in a few months. I wore it today in a snowstorm, that I worked in all day. I used on crashes, and vehicle’s off road. Partners said I was able to be seen easily. I will find out more when the storm continues tomorrow. 5 out of 5	Nice device! This is a really nice device. It has all the Series 100 features plus more. The compact size and it’s new design makes it more attractive. Hopefully soon all law enforcement agencies are going to have it.